Also Available As: The FNP Certification Review App! The second edition of this acclaimed FNP review continues to promote efficient, time-saving study by synthesizing the key content needed to pass the NP Certification Exam into a concise, well-organized format. Using test-taking strategies meticulously developed by the author, the Review provides unique question dissection techniques, targeted key content review, 600 in-depth practice questions, and detailed, current exam information in a fast facts style. This second edition includes new chapters on pediatrics and adolescence and an extensive new section on geriatrics that encompasses body/metabolic changes, common disorders, and hospice/ethical considerations. The book also presents an expanded, intensive pharmacology review, 100 new exam questions, and is the only review to offer a new research chapter providing elements of research needed for E-B practice. The book reviews the complete lifespan from pediatrics to geriatrics and including pregnancy, and covers non-clinical content including ethics, medico-legal issues, advanced practice law, and reimbursement guidelines. The review of primary care disorders is organized by body system. The content is applicable for certification exams for both the ANCC and the AANP. This book is also a great companion to the FNP Certification Review app, coming soon for your iPhone or iPad! Includes Exam Tips and Clinical Tips to help prioritize test content. It's a great companion to the forthcoming FNP Certification Review app! This is a well written, comprehensive review aimed at preparing readers for successfully completing a board certification exam. ...This is a wonderful comprehensive review in a concise study guide format. 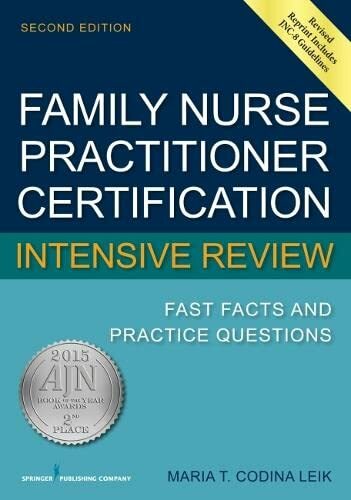 The second edition of this acclaimed FNP review continues to promote efficient, time-saving study by synthesizing the key content needed to pass the NP Certification Exam into a concise, well-organized format. Using test-taking strategies meticulously developed by the author, the Review provides unique ?question dissection techniques,? targeted key content review, 600 in-depth practice questions, and detailed, current exam information in a fast facts style. This second edition includes new chapters on pediatrics and adolescence and an extensive new section on geriatrics that encompasses body/metabolic changes, common disorders, and hospice/ethical considerations. The book also presents an expanded, intensive pharmacology review, 100 new exam questions, and is the only review to offer a new research chapter providing elements of research needed for E-B practice. The book reviews the complete lifespan from pediatrics to geriatrics and including pregnancy, and covers non-clinical content including ethics, medico-legal issues, advanced practice law, and reimbursement guidelines. The review of primary care disorders is organized by body system. The content is applicable for certification exams for both the ANCC and the AANP. Maria T. Codina Leik, MSN, APRN, BC, FNP-C is the President and Principal Lecturer at National ARNP Services, Inc., her own company. Well-known for her ability to simplify complex concepts for her students, she is a popular speaker and educator. Ms. Leik taught previously in the NP program at Florida International University Graduate School of Nursing. She is Board Certified in two specialties: Family NP and Adult Gerontology Primary Care NP by the AANP and ANCC. Her research findings have been presented at an international HIV conference as well as at nursing conferences. In addition to her two NP certification review books published by Springer Publishing, she is the author of book chapters in two NP textbooks. Ms. Leik is a member of Sigma Theta Tau International Honor Society.